Schweinshaxe is the quintessential dish of the Bavarian beer halls. A fork tender and juicy roasted pork knuckle with crispy skin – it simply has everything to offer. From appetizing looks to an unforgettable flavor schweinshaxe has it all. Not to mention that it is always served in the company of steins full of beer. In German Schwein means pig and Haxe means leg. Schweinshaxe literally translates to pork leg/shank/hock/knuckle. It is pronounced shvains-hakseh (ˈʃvaɪns.haksə). This is the Bavarian name. In the North, especially in the Berlin area the same specialty is called Eisbein (pronounced aisbain (ˈaɪ̯sˌbaɪ̯n) and is typically pickled, boiled and sometimes grilled. Why all the different names though? Some people call the knuckles ham hocks, others call them shanks. When Chris just ordered it, the line item of his meat vendor was titled ‘shanks’. It all depends on the exact cut from generally the same area of a pig’s leg. Sometimes you’ll get it with the skin still attached, more commonly without (in the US). Schweinshaxe is the lower part of the shank, at its very end, essentially the joint where the foot of the pig is attached to the leg. Pork knuckles are typically sold with the bone sticking out and have plenty of fat which sizzles away during roasting (OMG does it smell good)! In Bavaria typically the skin will be attached to the knuckles and during roasting will form a delicious crackling. In the US you must go to the butcher to find knuckles with a skin band attached. Do not worry if you cannot find pork knuckles with the skin attached – they are just as delicious without it. If there is an Asian store near you, they are your best bet to have it in their meat department assortment. Asians use the exact same cut in various recipes. It is very popular in Indonesia and the Philippines for example. Such is the demand for the cut that it is frequently imported. The Czech Republic exports huge amounts of pork hocks (shanks/knuckles) to Asia. Your second best bet is to look for pork hocks in the pork section of the meat department of your regular grocery store. If you do not find what you are looking for, talk to the person in charge of the meat department to see if they can order it for you. It shouldn’t be difficult for them, but often times they don’t simply because few people cook pork knuckles. If you are lucky enough to live in a town that has an actual butcher shop – just tell them what you are planning on cooking and you will likely get the royal treatment. Watch the video in our Roasted Pork Knuckle recipe card below for detailed illustration of the steps involved in preparing juicy and tender Schweinshaxe with a crispy skin. 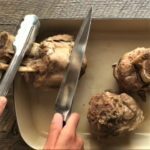 Even though preparing a Bavarian roasted pork knuckle is pretty straight forward as you can see from the steps in the video I want to elaborate on a few of these to give you a better understanding of why they are needed and why this roasted pork knuckle recipe includes them. Talking about agreeable flavors we like to add Doppelbock lager to the cooking liquid used to simmer the knuckles above any other beer style. It is the perfect, most flavorful beer you can possibly use in this recipe with its luxurious maltiness and rich spice profile. Scoring the meat once it has simmered is an important step as it allows for the crispy skin to form as the fat is rendered. Use a sharp knife and hold the knuckle steady in upright position with tongues (just like you see me do in the video). Traditional Bavarian roasted pork knuckle, aka Schweinshaxe. Fork tender, fall of the bone meat with tantalizingly crispy skin. Accompanied by roasted gold potatoes and Doppelbock based gravy. Finger licking required. 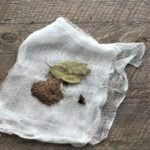 Wrap the caraway seed, bay leaf and clove in cheese cloth and make a little sachet. 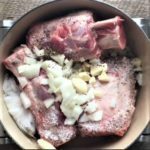 In a dutch oven or a larger pot with a lid, place the pork knuckles. Add the onion, garlic, salt and pepper and sachet with aromatics. Add the beer and the water. Cover with the lid, bring to boil over medium high heat. Once it starts boiling, reduce the heat to medium, the knuckles will continue to simmer. Leave for 60 minutes. Check on and move the shanks around once or twice during that time. After one hour, remove the knuckles from the liquid and place in a roasting pan. Let cool off a little bit. Score the knuckles with a sharp knife, especially the fattiest parts. Optional: With a hand held blender blend the cooled off liquid from the boiled knuckles. Use part as basting liquid for the knuckles and the rest as the base for a gravy. Place the roasting pan in a 375°F oven and roast for 2 hrs. You may vary the time depending on the strength of your oven, but 2 hours is average. Optional: While roasting the knuckles, baste once or twice with the blended liquid. The skin will get caramelized and become even crispier. While the knuckles are roasting, prepare the gold potatoes. Start by placing them in a large pan, drizzle with the olive oil, add the garlic, salt and pepper and water and coat them well. Let them simmer with a lid on over medium high heat until they begin to feel tender (test with a fork). Optional: Assuming you made a basting liquid and basted the knuckles, you still have plenty of it left to make a gravy. Melt 2 tbsp butter in a sauce pan, add flour and stir until a smooth paste forms. Add the basting liquid slowly and stir as you add it until it is well incorporated. Taste and season with salt and pepper. You now have gravy. Serve the knuckles with the bone sticking up. Holding the bone with a napkin, use a fork to strip the meat of the bone. The beauty of this recipe is that the cooking liquid is loaded with flavor and it is plentiful. This is why you see me blend it with a handheld immersion blender. 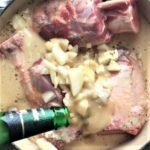 Basting liquid – when you baste pork knuckles with the blended cooking liquid the onions, spices and Doppelbock impart even more flavor to the meat and help a beautiful caramelization form. Gravy – any leftover blended cooking liquid is easy to convert into a true flavor bomb gravy (consult recipe card). You have got to go classic German styles here! 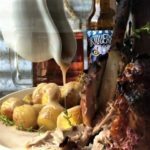 Whereas we enjoy having almost any German beer with Schweinshaxe, below are the styles we recommend that you pair with the dish to achieve a complementary food and brew interaction. Whether for a resonant roasty echo or a shared malty and spicy character these German styles will pair perfectly with the roasted pork knuckles. Both Chris and I have great respect for the magic of Schweinshaxe. Bavarian people know what they are doing, for reals. I have eaten my fair share of Schweinshaxe over the years. With crackling and without. Maybe a little bit more than a fair share in my twenties and less so in the past few years, but on average, I have demolished many of a roasted pork knuckle. Loved it every single time! My mom and her business partner used to travel around the South of Germany visiting customers and she brought me with several times when I was still in college. That is how I discovered the pleasures of beer halls and Schweinshaxe. Nothing better than entering one of those imposing great halls full of long wooden tables after walking around town in the rain. Warmth, good vibes, excellent beer and fragrant, tender, juicy roasted pork knuckle. With mustard. And spätzle. And gravy made with beer. And sauerkraut. When I first met Chris, he worked as a chef at the restaurant of a huge German owned (by a prince, His Royal Highness Prince Luitpold) brewery in Vail, Colorado called Kaltenberg. It was just a US location of the real deal, König Ludwig Schlossbrauerei in Bavaria. It was designed as a true beer hall, beautifully decorated and housed in a large building that was connected to the base station of the Lionshead gondola. You could ski right into it or download from the gondola and enter the beer hall. For whatever reason Kaltenberg was closed down, the building demolished and the area was redeveloped with what Chris and I call ‘monstrosities’ – huge hotels with hundreds and hundreds of rooms and sub-par restaurants. Chris is still friends with the brew master of that Vail Kaltenberg, he now lives in Switzerland and brews for a local brewery there. Looking back at the good old Kaltenberg days… I would say that even then Chris knew how to cook a wicked Schweinshaxe. I sampled on numerous occasions. He taught me how to do it and even ordered us the very knuckles in these pictures and video. Like I said, not a popular cut of meat and takes talking to your butcher to get some ordered. In our previous post we promised to acquaint you with the very special guests to our Oktoberfest Bash who are helping us turn it into a veritable feast. They have brought us a true cornucopia of amazing German food that looks great, tastes delicious and pairs very well with craft beer and Oktoberfest. We will do so in more detail in our next post, but for now, we want to welcome them and thank them for coming! We are beyond grateful for the honor. Thank you fellow bloggers for making our craft beering blogging experience so rewarding – it would not be the same without you. You are always welcome at our table (even if you don’t bring food:). Cheers and ‘Zum Wohl’ (To health!)! Here is the line up for the first ever Craft Beering Oktoberfest Bash! Pictures of the dishes are in the pretty gallery below, while the names of the recipes lead to the respective blogs of our guests. Do go around and mingle, you will love them! Thanks so much for answering. I’m planning to do this tomorrow for a twist on Easter Ham. Do you think i could do the 60 min simmer the day before? Yes, you can do it tonight, then let them cool off to room temp before you refrigerate them covered. We are doing the same thing with our lamb shanks for tomorrow:) Happy Easter to you and yours! Tks again, I’ll let you know how goes. Happy Easter! Another question, in the pics it doesn’t look like there’s much skin on the hocks, did you remove skin or did you just buy hocks with little to no skin? Hi Vic, the ones we used for this post had the skin removed. You can specifically request them with skin on from butcher. Hope this helps! It appears that you are steaming/brazing the knuckles instead of boiling (submerging meat in water). Is this correct and how would you scale this up for 6 knuckles? 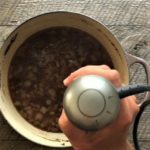 Finally, how do you think a pressure cooker would work? Hi, Paul and Happy New Year! Yes, you are correct – the simmering step is essentially braising and typically we just use a dutch oven. 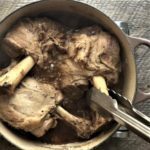 I think that if you wanted to shorten this step and use a pressure cooker 30-40 minutes should be enough to soften the meat but it depends on the size of the shanks, how many at a time and the specifics of your pressure cooker. Chris says at least 30 minutes. But we do recommend the slower method if you can budget the time for it and have a big enough pot, the simmering at lower temp brings out more flavor. If you hover over/touch the servings number in the recipe card a little slider will appear and you can move it up to scale the recipe. It works more or less correctly. Hope this helps! Thank you for stopping by! Oh, this sounds very awesome! 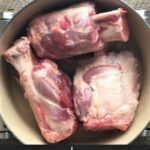 I am getting a couple of pork shanks/knuckles sometime towards the end of next month, from a meat share. A recipe like this will go very well! Thanks for sharing! Forget about pork chops! I haven’t eaten pork chops for probably years, but pork knuckles and hocks are in our weekly rotation LOL! Love this stuff! that is one beautiful hunk of meat!! My mouth is watering – thanks for sharing at the What’s for Dinner party. Hope you have a wonderful week! This was my favorite dish to eat in Munich! I love that you came up with an easy way to make it here! Recipe was very easy to follow. Finding the knuckles not so much. All in all – thank you! PS. The gravy=perfection. It really does become fork tender which I find amazing for such a weird cut of meat. Got the knuckles at the asian store nearby, very inexpensive. The gravy from the boiling liquid rocks. This looks amazing, the meat looks like it will just fall away from the bone! My mouth is watering. You are certainly cooking up a storm for Oktoberfest, this looks delicious. I startled Hubs when he was still at work by calling him and inviting him out to try a pallet of beers. He really was surprised and loved it. The last time I drank beer had to be one Guinness about five years ago. Your blog is converting me. Yes! Fist pump! We’d love to introduce more people to the pleasures of well crafted beer! There are so many style and innovations happen every day. It is very exciting. Thank you Leanna! This looks incredible – sign me up for Oktoberfest !! How cool that you get to this! Chris would love to be able to buy a whole pig. Perhaps with several sets of hind legs = more knuckles, lol. Thank you Karrie! I have never had a roasted pork knuckle, but this looks amazing! I am sure it’s the perfect thing for an Octoberfest party, too. Thanks so much for sharing your recipe with us at the #HomeMattersParty this week. Thank you Nicole! 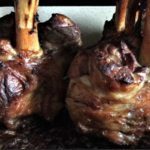 Hope you get to try some Schweinshaxe soon – you will get hooked! Your Roasted Pork Knuckle looks amazing! Your photos are just beautiful. Thanks so much for sharing with us at Full Plate Thursday,we are so happy to have you join us. Have a wonderful week and come back to see us real soon! Thank you soooo much Miz Helen! Always a pleasure to stop by and see what everyone else has been up to. yasss this looks amazing! the flavour combination sounds epic too! I’ve never cooked with pork knuckle before, but this looks great! thanks for organising the round up! it was so fun! Oh my, you also know what you are doing for reals! Your description of going to Germany and the beer halls on trips with your mom made me feel like I was there. This schweinshaxe looks so good! Thanks so much for organizing the Oktoberfest Bash and for inviting me! Cheers! Sometimes I feel like I am back there:) Thank you Rachelle! So happy that we got to do something together! My god, roasted pork. The smell, the juiciness, the…porkiness. That looks like heaven especially with a huge beer and those potatoes. The problem, as I see it though, is when, WHEN will I find the time to make ALL of these German recipes? I mean, these are foods I’ve never heard of but seriously want to eat! Browsing through, I’m actually thinking of German food Thanksgiving. That could work. Thanks for this great #Oktoberfestbash! You guys rock. Why not? I wouldn’t mind the rouladen of the pork loin instead of turkey. And the bees sting cake is better than any pumpkin pie! Thank you Jaxx for joining us! Thanks for sharing so delicious and mouth watering recipe with us. As I got to make something Sunday special and I think every one is going to love it. Lovely and healthy recipe! I saw a lot of pork knuckle while traveling throughout Germany. I don’t eat meat and I especially don’t eat pork but I’m not ashamed to admit I had to taste one or two while traveling. The skin was just so crispy it was impossible to resist. I can see why it s a Bavarian Specialty. I also enjoyed visiting the fun beer halls, they were even able to accommodate my food restriction. i can’t wait to visit Germany again. That is a great story! I’ve mainly been to the south, Schwarzwald and Bayern, but I’ve heard they eat Schweinshaxe up north too. It’s too good to pass! Would be cool to go visit there again, you want to sign up with Kelsie and us for next year:)? Oh I have so much to say. First, when I imagine German food, this is exactly what comes to mind. Rustic and totally delicious! Second, I think we should organize a trip to Chris’s friends brewery in Switzerland. Research for next year’s bash :). Thank you guys so much for organizing this! I’m having all kinds of fun reading everyone’s posts! Happy Thursday! Now we are talking! Let’s look into that trip:) Word of caution – last time Chris went to visit him I stayed in Freiburg and he went for two days (it is just outside of Basel). Chris ate horse meat burger at his brewery! Apparently a coveted food item in Austria, parts of Switzerland… I was glad I stayed in Germany:) Once we emerge from the eating and drinking of this year’s Oktoberfest, let’s get down to business planning:) Such a great day today reading everyone’s posts! We cannot thank you enough for organizing this amazing group of people and their fantastic recipes! Loreto and I (well, Loreto more 😉 ) we had a blast cooking and sharing the food we made, accompanying it with a wonderful Canadian cold lager. Your pork knuckle, joint, shank, or whatever they want to call it, is absolute perfection! Nicoletta, the pleasure is entirely ours!!! OK, let’s share:) We are very fortunate to know you guys and everyone else who contributed! Today is one of these days when you just sit there and pinch yourself to be sure it is really happening. We love your recipe! Chris is vert impressed by that crackle singing skin of your pork shoulder dish! Annie! Thank you for stopping by! So glad to have you join us! Thank you so much. Just wow!! I can imagine that the basting liquid turned gravy is beyond delish and I would have to be careful not to just drink it straight up, lol!! You got some gorgeous colour on those too. Love that you used the word ‘wicked’ – I use that one all the time 😉 Awesome video too! Thank you guys SO much for including me in this fabulous round up! Much appreciated! Cheers, my friends! Yes, wicked is my favorite word of yours:) The gravy is so fragrant! You can taste the clove, seriously. When you baste, the color becomes darker – so much more dramatic, haha! Thank you Dawn for joining us, so grateful! This looks and sounds to die for! Thanks for organizing this Oktoberfest bash. I’m seriously drooling and it’s 8 am! Thank you Cathy! So glad you joined us all and that you solved our pretzel assassin issue:) Always inspired by your work and stoked to have this virtual Okotoberfest bash. I am (almost 🙂 speechless. Stunning! And I love everything about this dish. Absolutely Oktoberfest food perfection!! So very flattered by your words Jennifer! We are buying you a large beer for sure:)Thank you so much for contributing your recipe for Rouladen, they will be happening!